This was written by Becky, a friend in one of the groups I’m in. I don’t care if you have kids or not, print this because it is very inspirational. I’m very fortunate to be allowed to post this for others to see. You’ll hear and see the sounds of the night much differently after the read. This is my friend, YouWho, the Night Owl. He lives in a forest and spends his nights on this branch or that, watching. YouWho has always loved to watch over people. He felt it was something pleasing to his Creator. Way back when, YouWho had no name. He was just an owl like any other. But he wanted to be more than just another owl. He wanted to do something more than just watch over people. So he asked his Creator to please make him different. Well, it didn't seem like his Creator had listened. Nothing made him different. He went about in the night time as usual, with a "whooo" there and a "whooo" here, watching over people passing through the forest. One day YouWho's voice changed. When he was hooting "whooo", it sometimes came out more like "you". It turned out he was sick. Soon all he ever hooted was "whooo YOU" . . . "whooo YOU". Even after he got well, it went on. YouWho was getting pretty frustrated. Then, people he was watching over started answering what they thought was a question - "whooo YOU?" here late to take neighbor Joe to the airport." up before the sun to get my Mom some eggs." This was exciting and YouWho thought the Creator had finally bestowed a special grace upon him. He began to feel great pride when people gave him answers all night long. After all, no other owls could hoot like him. And no other owls got answers. That was until all the people he watched over got tired of the same questions, night after night after night . . .
"Would you just shut up, already?!" "Find another tree, you fowl owl." Boy was YouWho angry. He was angry at his people and really, really angry at his Creator. And so discouraged. But he tried to keep his heart open. Even in his pride, he did want to serve the Creator. "Turn it around to do more". Poor YouWho. He pondered and he pondered. He frowned. He thought, why doesn't the Creator tell me more? And he frowned and frowned and pondered some more. He tried out various ways to "turn it around", even sitting backwards on his branch in the night. After all, what seemed awful foolish to him might be wise in the Creator's eyes. He even thought, maybe it was a miracle message and people just didn't "get it". "Creator? It's me, Charlie. Me again. I'm probably making You mad. It hurts too much to go on. tired of struggling, falling down. "Where are You? Are You anywhere? How could anyone think the Creator doesn't care?? Well, when this hopeful, prayerful, faithful little owl heard the words, "if You're dead too" . . . he couldn't help but hoot. He was so upset he mixed up his hoots! Instead of "whooo YOU", out came "YOU whooo". He was so embarrassed he covered his beak with both wings. "It's YOU whooo the Creator loves." Suddenly YouWho knew! In the night, on his branch, with his odd gift, he could do more! He could share the Creator's love! Suddenly he felt so humble - and so blessed. Most of the owls, the ones who knew their Creator, served Him without knowing clearly what He wanted them to do – exactly. They knew to love others as well as themselves . . . and to love themselves as well as others. And they served Him well. That was a good thing. YouWho didn't understand why the Creator had given him this peculiar gift, but he was ready to do what he'd been equipped to do. YouWho would serve Him well. And that was a good thing, too. YouWho set out to hoot his special message, night after night, all night long. Many of the people would pass by and say, "what a strange hoot". Before long they were calling this "weird" owl, "YooHoo". Some of them called him that just to make fun. And it hurt. He didn't feel very blessed anymore. But then . . .
. . . there were the ones who didn't make fun. The ones whose faces would change as they walked by. There'd be happy smiles, or shouts of joy. There'd be quiet tears, or lined faces would soften with peace. They were listening and their hearts knew. Just like Charlie. And they were comforted. YouWho saw all this and so he too was comforted. Many, many people, still laugh at YouWho. They still call his hoots "YooHoo" and they make the Creator's message into a joke. But it no longer hurts to hear them. His Creator calls him YouWho - that's all that matters. And that's how this faithful little owl got his name! When YouWho accepted his peculiar gift (his odd hoot) and began to use it to serve his Creator, he became filled with the Creator's Light! At night, when YouWho is watching over people, his Light always shines brightly. There are lots of trees and bushes in the forest, so you have to be trying to find YouWho's Light to see it. Some people won't stop to try finding the Light during their rushing and worrying. Some would rather walk in the dark. Some are trying to find ANY kind of light, yet when they see the Creator's Light they pay no attention. Ah, but many, many people find His Light! And carry it with them everywhere they go. The Creator is pleased. YouWho has served Him well, and is content. And that IS a good thing. YouWho has left the forest. He carried his Light with him, but the Light is still there!! How does the Creator DO this? You and I can leave the Light behind us even as we carry it with us? That's a Mystery to me! It has to be a Miracle! YouWho's Light IS still in the forest and he HAS left. But I know where he went. He went to find you! Because I sent him – well, I asked him anyway. The Creator sent him, so I shouldn't try to take all the credit . . .
Now YouWho's Light shines just for you! You can see it anytime you need it. Then after you've found the Light shining for you in the dark, others will be able to see the Creator in you! But don't try to understand it, none of His people really do, even those who know their Creator. All you have to do is open your eyes to see the Light in the dark. It will show you where to go. Just let it happen, your Light. And always have Comfort in the night. And remember, "it is YOU whooo the Creator loves". Now there’s a little known secret about kritters. While you may see kitties running around outside, birds flying overhead, or other kritters wandering around in wooded areas, they also play instruments. They make sure humans never find out because they would be captured and be put upon to exhibit these skills. Ok, back to our story. Amanda and Alex headed over to Koko’s to pass the word about the auditions. Koko in turn made sure a notice was put in the Leaves and Grass Gazette. In the meantime, many of her charges pulled out their instruments and started to practice some rusty skills. Up on the cliffs, Aesop had seen the notice and passed the word. We really should feel sorry for those poor fishermen. Those first few sour notes the Eagles threw out scared those guys so bad they dropped their poles and tried walking on water. Amanda and Alex headed over to sign up since Alex played keyboards and Amanda did vocals. With the advance notice they had they were the first to sign up. The auditions were held in a cave that was very hard to find. This kept out nosy humans. The wild bunch headed inside to see if Alex had to bring his own keyboard or if one was available. He lucked out. The line was long on audition day. To pass the time, many of the kritters warmed up their instruments. No, that wasn’t some freak accident of nature you heard. That was just a mixture of odd instruments playing different notes at the same time. Auditions were over and the final cast was notified. Only one vocalist and one keyboardist signed up. Alex and Amanda were in. now came the grueling practice sessions. But they finally were ready for the big show. Next up: the show itself. This may be updated from time to time. When things are going smoothly, it’s easy to be friends. It is even easy to be there when tragedy strikes one of them. But when words get twisted or even if one thinks they are twisted, communication breaks down. It is at these times when the lines of communication must be open the widest! That is when a friend is needed most. When one friend is emotional and the other totally logical unable to deal with emotions, it is very hard to communicate. Emotions are such a driving force that it can be hard to keep them in check. For those non-emotional people, it is not possible to understand this. It is easy to say you know someone. But to truly know and understand them requires years, especially if one of them is driven by emotions. These are the romantics. They talk from their heart. The private post is now public. Maybe others can see themselves in it. Is this someone you know? It was for me. It causes more pain than one can imagine. You see in your minds eye, your physiological and emotional ills. Because of that you have convinced yourself that you cannot be loved. With that mindset you put a lock on your heart, on that emotion defined as love so that true love cannot enter or leave. When someone comes along that truly and deeply loves you, you automatically know that is impossible but with your psychology training, you do know that it is obsessive love. When someone like me comes along that knows about your physiological and emotional issues but does not care because the love that is offered comes from deep within the soul you have no way of accepting me. But your heart is locked so tight because you know you cannot be loved so you will not open your heart to accept the deep, devotional true love since it can, to your perception, only cause pain and sorrow. You have experienced the romantic seeds of physical love, but you have not opened yourself up to explore the fruits of true love. Have you ever experienced a love where your first concern is how the other person feels? A love where you know what they will say before they say it? A love so strong that just being with them lights up a room? A feeling that when the other person is happy you are happy but when they are sad, or hurt it affects you twice as bad? Have you ever felt a love so strong that you want to tell the world about it? But yet you don’t because you want that person solely for your self? Have you ever felt a love so strong that the pain of the other is your pain also? A love so deep that it transcends all of nature? A love that depends not on distance? Have you ever experienced a feeling that cannot be expressed in words? Have the feelings of the other person been so important that to make a mistake affects the very soul? Have you ever experienced a love so strong that the loss of the other makes you want to tear your heart out? I write the words, yet they are read wrong. I cannot say them any plainer. I know not the simple way of speaking. I have tried to be direct yet it is taken wrong. Do I write such drivel as to be thought mad? Or is the pen I use more poisonous than I would ever conceive? I speak from the heart yet I appear to be throwing knives. From the depths of my soul do I feel the heat yet it comes out as ice. Fear not for I am but the holder of the feelings. I share them willingly but they are thrown back at me in anger. Lest I be thought the spirit of evil, nay, lest my heart be stilled, I cannot belay the heart and soul of the love that dwells within. It is the fire of a thousand suns but is taken as the ice shelf of the universe. Can not I say what I mean and have it taken as I mean it? For what lies in the heart of one man is not felt in the heart of the woman. The feelings cannot overtake the logic of the mind. I dwell alone in this sea of pain and sorrow. Hear me not for my words are but ink upon paper. What they have in meaning is but for my heart to explore. I find it amazing how few people understand what true love is. It is all too often confused with obsession or lust. Is it possible to really define it? A biblical quote does do it justice. ”Love is patient, love is kind. It does not envy, it does not boast, it is not proud. It is not rude, it is not self-seeking, it is not easily angered, it keeps no record of wrongs. Love does not delight in evil but rejoices with the truth. It always protects, always trusts, always hopes, always perseveres. Love never fails. —I Corinthians 13:4-8a (NIV)” How often does the analytical mind cross with an emotional body? What are the results of such a meeting? It’s the difference between being literal and being figurative. The analytical mind reads lines that are written while the emotional one reads between the lines. Neither is wrong, yet the information between the lines is oft the most important. When you are troubled by the emotional ills of others, you do not understand that others, knowing of your emotional ills are not concerned and only see the brilliance that is you. The above is true, but can an analytical mind understand it’s true meaning? There were no lyrics. The gentle pressing of the keys eased the pain in his heart. The snow, piled deep, could not chill the heat, the passion, this man felt. Even the roiling clouds, the horrendous wind, could not blur his vision. His ears, indeed all his senses were acutely aware of the moonlight. The serenade painted a vivid picture of him and the girl he lost. His heartbeat was rapid, the pains increased. Why, he asked himself constantly, must I go on? Why must I endure this agony? The strings of summer sang like velvet. Vivaldi could bring the seasons to life. Why then could not the strings of his violin infuse life back into this man? Does not the warm thoughts of a sultry August night ease the hurt of lost love? Let the strings resonate yet they are unmoving. Love has done its damage. Will he recover? Words, does he hear them? Does this hotel really exist? He’s walking the streets of loneliness. There is a room for him. He does not want to be there but it is where his heart dwells. What baggage will he carry in? How much more will he carry out? Does he really want to survive this? He prays. Yes, there is peace in the valley. His life, his personal plague on this earth is beyond his comprehension. He begs God to call him home. Why, he asks, must he go on? He knows his mansion, his home in heaven is only available when he receives the call. It is not his decision to make. He understands the valley of peace. Tissues dab his eyes. They have become misty. Resting now, his feelings sharpen. Thoughts of love lost pulls out his tears. A heart broken, a soul in torment yet his love remains true. A mellow voice and a quiet tune weakens him. Must he live to suffer? A timepiece to measure that which has no boundaries. Never is indeed a long time. His love extends well beyond those limits. His love will last, til the twelfth of never. Dotty’s Topsy Tale deals with discrimination. What was your primary inspiration? 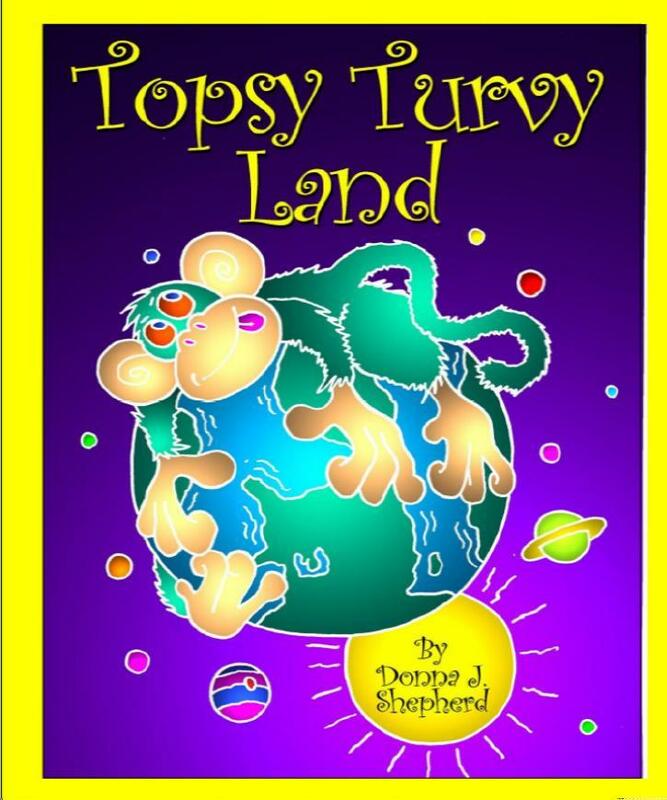 In Topsy Turvy Land, I came up with a whole menagerie of animals, like green monkeys, singing snakes, and hot pink hippos. Kevin (the illustrator) suggested that I write stories about several of the animals. One day while brainstorming with my daughter for ideas, she asked, "Isn't Dotty pink? What if she wanted to play with purple hippos? Would that be a problem?" I decided, yes, it would, but not for Dotty - only those around her, and more specifically, the grownups. You deal with how to handle being different. That almost begs the question of how do you define normal? When my children were little and would complain about someone being weird or different, I always reminded them that we are all weird in our own way. Growing up with five brothers and sisters, I was the only left-handed child. My dad tried his best to make me use my right hand because he wanted me to be normal. Not until I entered school did I realize there were other people who functioned quite nicely being left-handed. And besides, aren't the so-called different people the ones who make life so interesting? If we all conformed to the same standard, we'd have a very boring, beige world. Kevin Scott Collier is the illustrator. How is he to work with? Kevin has been a delight. He gets my sense of humor, and adds so much with his whimsical style. We have never met in person, but we both feel like we operate on a similar wavelength when we're working on a project. You get your points across with green monkeys and singing snakes. I can understand the green monkeys, but how did you come up with singing snakes? As a singer myself, it is only natural that I include a character that sings. I have written another book featuring the snake. His story was so much fun to write. I can't wait to see it in print one day! Living Waters is the publisher. How are they to work with? My experience has been good. Kevin and I subbed directly to the person who owned the company at the time after she posted a request for submissions on a Yahoo group, so I'm not familiar with their current submission guidelines. As a new company, they did offer several types of contracts, but with mine being a traditional contract, I have no experience with any other type. Since the Dotty's Topsy Tale has a lot to do with color, I was hoping the colors would be vibrant in the finished product, and are they ever! It turned out beautifully.